According to Wikipedia, a frisket is any material that protects areas of a work from unintended change. I've always been interested in fabrics that use a resist as a way to create a design. 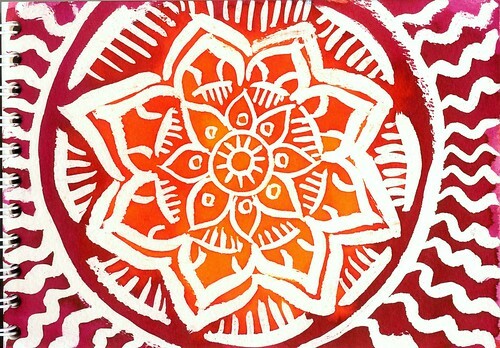 Batik is one example, mudcloth another. I could visualize what I wanted to do, but I couldn't figure out what to use as a resist. Wax crayons didn't work, and white india ink did just so-so. Painting with the white ink also proved to be kind of challenging on white paper. 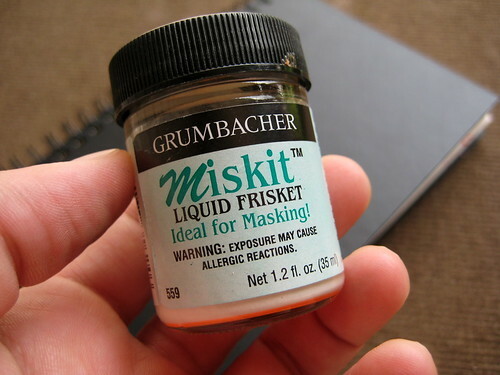 I finally came up with the idea of using a liquid type of frisket most commonly used in watercolor painting to mask off areas you wish to remain white. I bought the bottle shown above at Blick, and applied it with a thin watercolor brush to the paper. 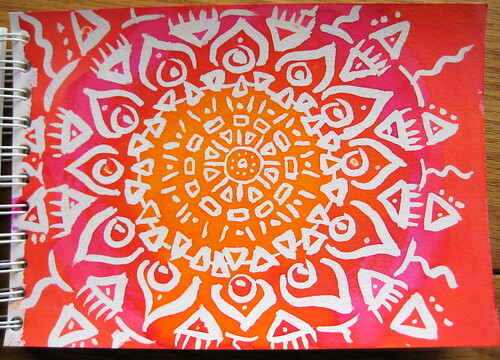 Since it has a bright orange dye in it, it's much easier to see on the paper. The brush does eventually get all gummed up because the frisket is latex based, but per the instructions, "It washes out of pens and brushes with soap and water." Once dry, (it dries pretty quick) I would work with water based fountain pen inks applied with a sponge brush. Sometimes I would let all of the ink soak into the paper, sometimes I would blot some of it off. All of the images above were created in this manner. Once the ink is dry, you start to carefully roll the frisket off the paper. It comes off in rubbery boogerish (sorry) bits. On the last image, I used a marker to add additional detail to the white spaces. 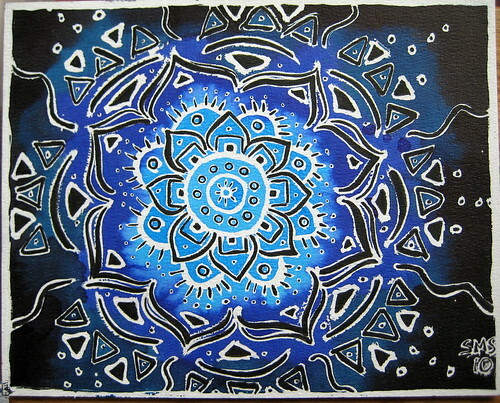 These mandalas look wonderful! I'd like to try that technique myself.